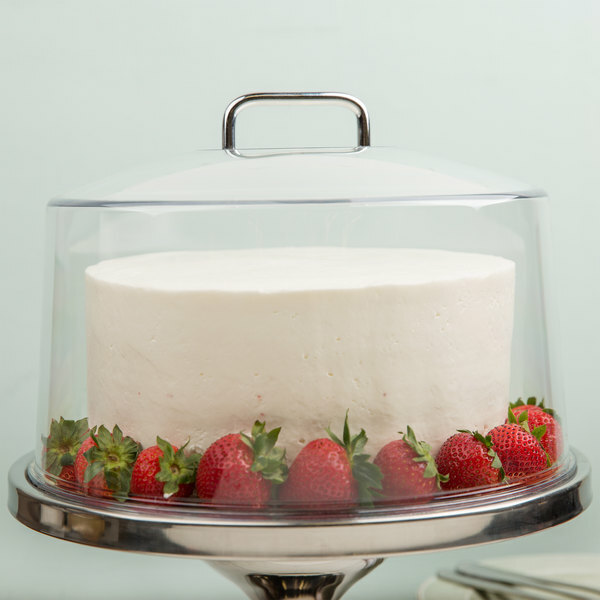 Show off your deliciously exquisite baked goods, finger foods, hors d'oeuvres, appetizers, or desserts while protecting they're quality and freshness with this 12" round Cambro RD1200CW Camwear clear dome display cover. 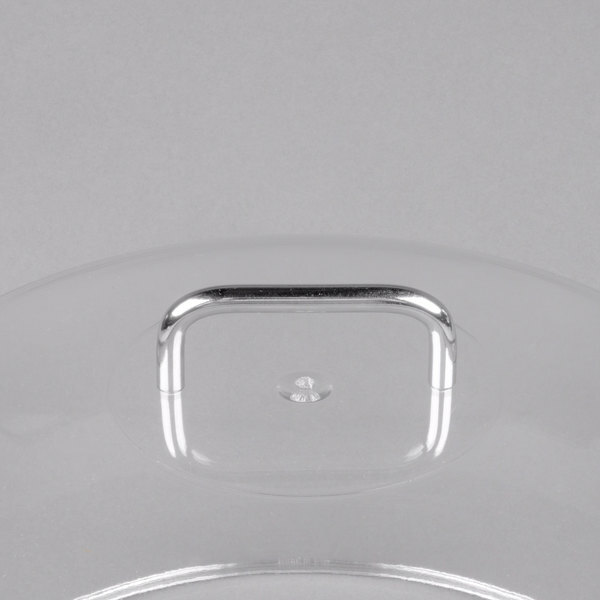 The Cambro RD1200CW Camwear dome tray cover combines the look of upscale glass with the durability of break resistant polycarbonate plastic. 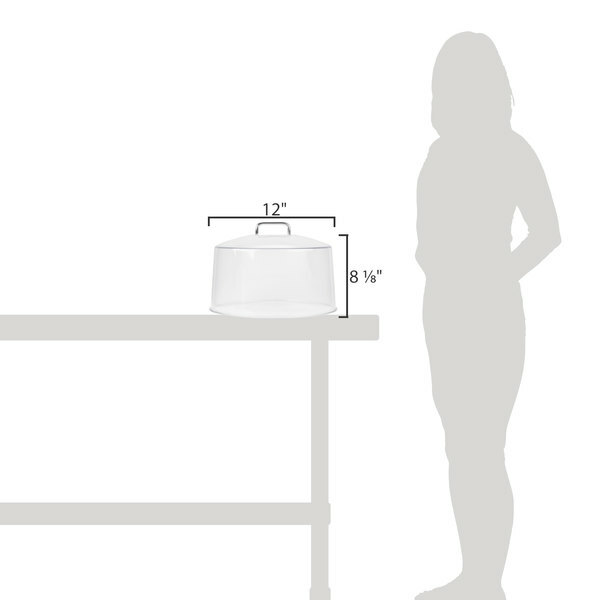 Height (with handle): 8 1/8"
This is nice for displaying 10" x 6" high- sized cakes. We use this on top of our rotating 12" cake pedestal from webstaurant. Very good quality. Fast shipping. A classy and elegant way to display pastries or other baked goods. 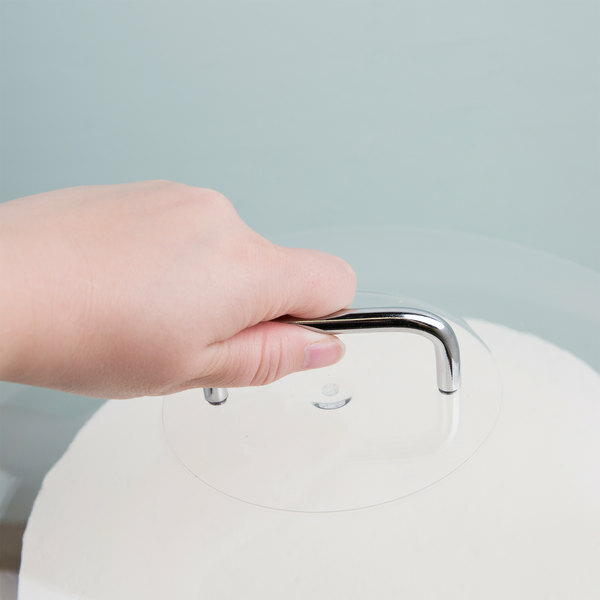 The handle is large enough to get a good grip on it and not worry about dropping it. 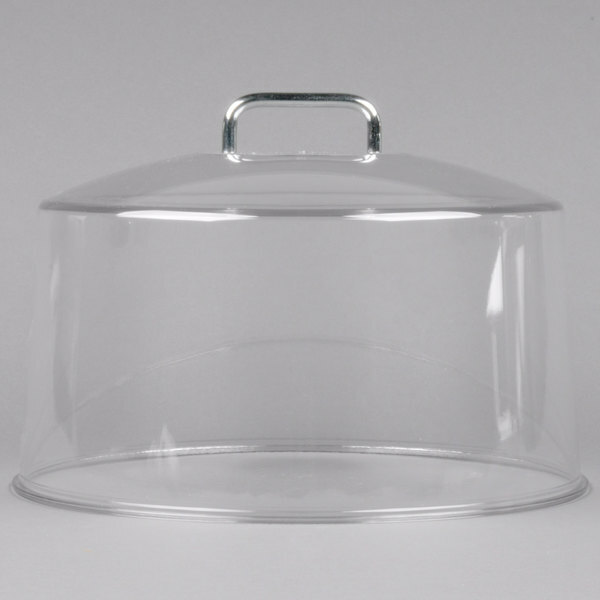 This is a great lid and it fits well on our cake stands. 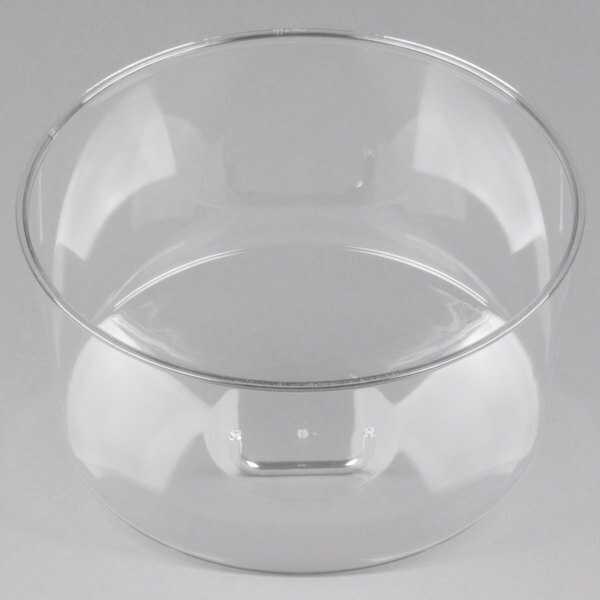 it is easy to clean, crystal clear so you can see all the yummy goodies inside and is very sturdy. This cover is very inexpensive and displays our baked items very well. The shine starts to fade after a few washes but you can't beat the price. Got this cake dome together with the Stainless Steel Cake Stand 13". super awesome combination. Looks like glass but its lighter and perfect to display and cover any cake. The silver handle give it a nice touch. I dropped a less expensive cake stand cover 1x and it cracked in half. I learned that you get what you pay for and that Cambro Covers are much better quality. First time ordering plastic cake cover and we ordered two different price points so that we can decide which on is of better value. This is a higher price point one but definitely is better made. Plastic has a better clarity and I assume it will also last longer vs. the other. Hopefully it will not "cloud up" too fast. Made in USA is a plus. 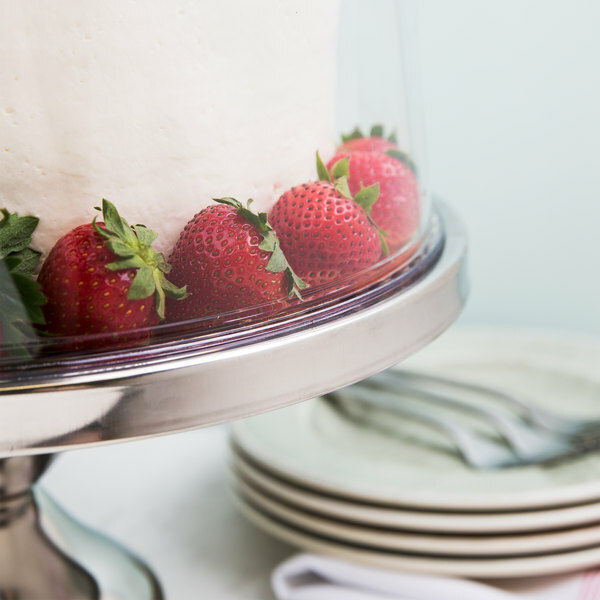 This round cake done is perfect for displaying a whole 8" cake for slicing. It is difficult to find a dome tall enough to hold a 3 layer cake and this one was perfect! I bought this higher priced version based on reviews. So glad I did. This is a nice sturdy lid. My other lid was a third the cost but broke and cracked after three uses. This one is going strong with daily use from kids.... the ultimate test. 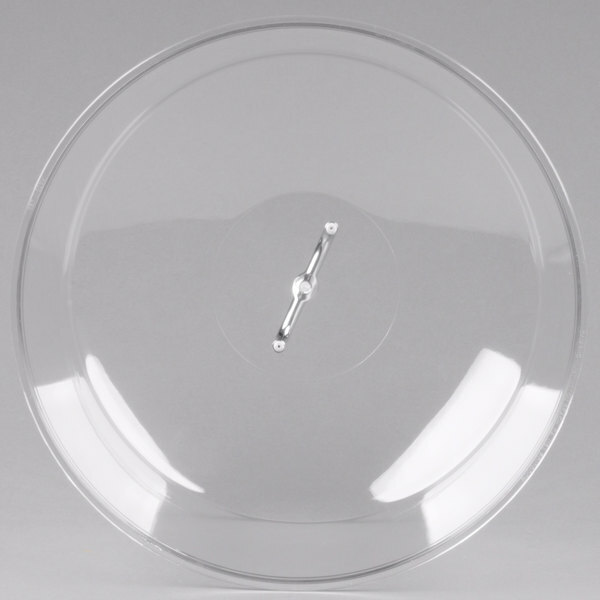 We use this 12" Clear Dome Round Display Cover in conjunction with the 13" stainless steel cake stand. We use them for presentation purposes, and it adds a bit of old fashioned style to the presentation. It works extremely well. 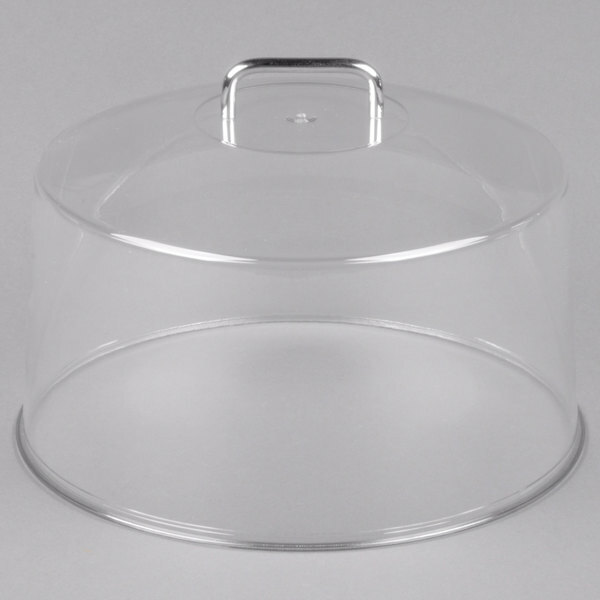 I purchased this along with the cheaper clear cake cover and two cake stands. This cover is a better quality than the cheaper one, but cost twice as much. The plastic is thicker and clearer. I was very happy with both. These covers are way better than the first one's i purchased, much stronger and not as flimsy. I dropped one on the floor and to my surprise it did not break!! Bought a few of these cake domes. While one came in cracked, Webstaurants was very quick to send me out a new one! These looked great on top of my cake stands, kept the little critters off of my baked goods, and were the perfect size for my high swirled cupcakes! Nice clear heavy dome. Sits nice on the stainless pedestal they offer. I was worried about scratching but we hand wash and dry and no problem. Worth the couple extra bucks. I love it! It's very sturdy and strong. I think i made a right decision to choose this instead of the cheaper one. definitely worth every penny! This dome display cover is perfect. It fits easily over my high cakes and desserts. Thick and very clear plastic with a comfortable metal handle. What an impressive looking piece! I bought this as a replacement for the cover the cake pedestal came with because it broke; and I like this one much better. Very thick and very clear plastic. Won't "hide" your cake under a frosty dome. I like that. The product needed to be durable but attractive because it is used by our guests at the B&B. The cover suited our purpose perfectly. I am happy with my purchase. Very roomy and sturdy. Incredibly clear dome. I set this dome on a large plate and have room for a small cake pedestal inside to display two tiers of treats. The handle is heavy and feels well made. I was leery of other domes, worried they would scratch easily so opted for this one. Worth the price. I do wash and dry by hand to prevent any surface scratches.